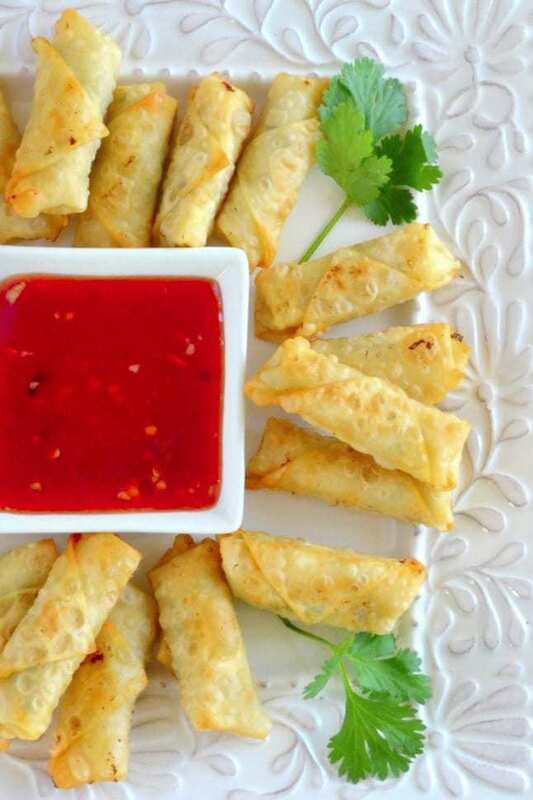 Mini Shrimp Rolls with Homemade Plum Sauce ~ crisp rolls filled with shrimp, fresh ginger, and spring onion, with a tangy plum sauce ~ better than take-out! In the bowl of a small food processor put all the above ingredients and pulse till finely minced. Do it by hand if you have the patience. Set out a wonton wrapper on point. Place 1 tsp of the filling on the wrapper. Bring up the bottom corner over the filling, then fold in the sides, and continue rolling. Moisten the top corner with a wet finger and finish the wrap. Set aside on a plate while you wrap all the rolls. Heat 1/4 inch of vegetable oil in a large skillet until hot. You will see the oil quiver on the surface and hear a sizzle when you place the rolls in the hot oil. Fry the rolls, in batches, for about 2-3 minutes, or until golden brown, turning once halfway through. Drain on paper towels. If you are making these ahead, you can reheat in a 350 degree oven for several minutes. To make the plum jam: Put all the ingredients in a saucepan and bring to a boil. Simmer the jam, uncovered, for about 30 minutes, or until thickened and glossy. Stir occasionally. Keep a small plate in the freezer while the jam cooks. To test when the jam is done, take the plate out and spoon a drop of the hot liquid onto it. Let it sit for a minute and then push it with a spoon to see whether the jam has ‘gelled’. If so, it’s ready, if not, keep boiling. To make the plum sauce: Heat the ingredients in a small saucepan, starting with 1 Tbsp of the vinegar. Bring the sauce to a boil, then turn off the heat. Taste and adjust the seasoning if necessary, you want a nice sweet and sour tang. Let it cool, then bottle it and refrigerate until needed.